collaboration | Story by the Throat! I attended the Original Practice Shakespeare Festival‘s “Much Adoe About Nothing” in Kenton City Park. I loved it. The cast were a fun and energetic bunch, and the intimacy of our close proximity on the grassy lawn, with the players’ antics spilling freely among the audience, made the whole spectacle a delight. OPS Fest recreates that practice, and the result was enthralling. I love live Shakespeare, and I’ve seen some fine performances, but what I experienced at Kenton park on Sunday was like nothing I’d seen before. You might think reading their lines from cue scrolls might render the performances lifeless, but not so! Instead the play crackled with life, brimmed with humanity, and embraced messiness. 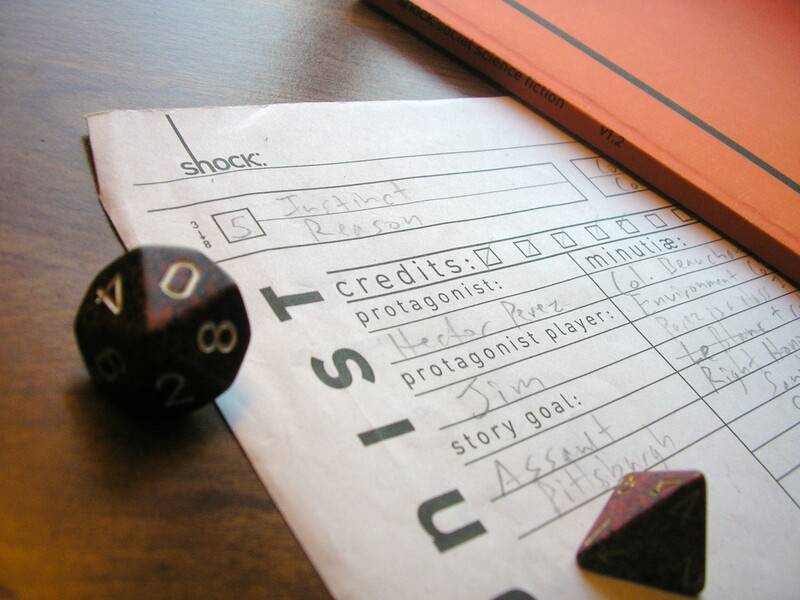 I recently played a game of Shock: Social Science Fiction by Joshua A.C. Newman, with my wife and a couple of friends. It lasted something like 4-6 sessions, was fun and rewarding for us, and produced a satisfying story. Not only was it a work of art to be proud of, but it retained tension and life for us as players the whole time we were playing. Looking back, I can see several solid reasons why. In Shock: you pick a future shock, some fantastic sci-fi development that irrevocably changes the world, then brainstorm relevant social issues that the Shock would exacerbate. 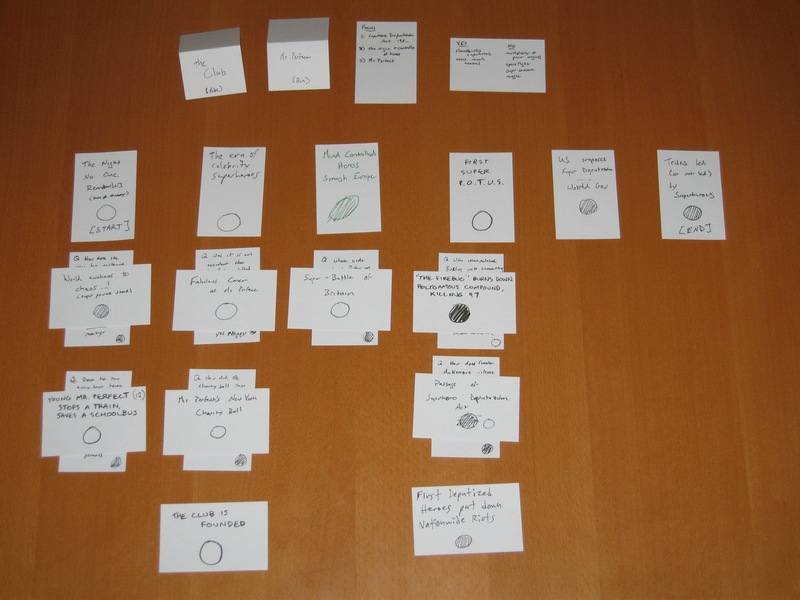 You then each play a Protagonist in this alternate world who wrestles with one of the Issues. In our game the Issues were War, Class, Man vs. Wild (actually more like Civilization vs. Primitivism), and Living in Denial. The Shock was dependence on fossil fuels being replaced by dependence on alien technology in the control of a scientist elite. Utopian city-domes rise up across North America, while outsiders in the wasteland are left to their own devices, and exterminated when they cause trouble. After we concluded our final session, I reflected on play and noticed that several key aspects of the rules and procedures kept play fresh, engaging and satisfying. I’m going to break down the lessons I learned as I describe the path of our story. We excel when we lift one another up. The game was fun because we all built on each other’s contributions at each moment in play. We could easily have been four individual creators, each plotting our own brilliant artistic statement with our own story material. Each individual statement could maybe have been artful and satisfying, even brilliant. We might have even been courteous and generous in allowing each other space to build our little artistic towers, not crowding each other and jostling each other for the spotlight. We might have all created something we could look back on and say, yes, it was good.